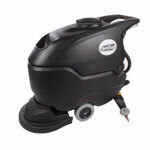 This front replacement squeegee blade is designed to fit the Viper 20" Rider Floor Scrubber. The channel notches allow solution to be directed into the suction opening and the solid rear squeegee blade keeps the floor scrubbing solution in the suction path to help dry your floor completely. If you squeegee blades are leaving streaks on your floor, first check them for any debris and wipe them clean. If that does not make a difference, then look at adjusting the squeegee assembly down pressure on the floor, and lastly look at rotating/replacing your squeegee blades.